A Php is a free and open source technology that can be used with Windows, Linux, Solaris, and various other UNIX platforms. So your server investments can be utilized on all platforms without additional expense. D’selva PHP team is equipped with skilled and proficient expertise of PHP developers offering prime quality web development services. Depending on the complexity of projects, our PHP development and programming services inculcate the appropriate and most suitable methods for execution and implementation. Our Team know exactly how to leverage the maximum potential of PHP as a scripting language. 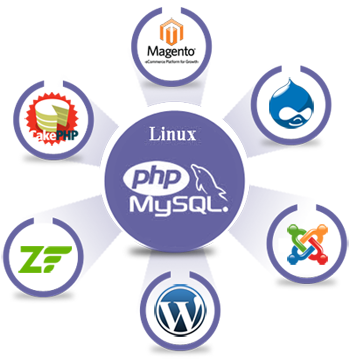 Housing an entire team of PHP developers and designers, we assert our competence in working with Linux Apache MySQL PHP (LAMP) & AJAX. Our Web Development Service is experimental, composite and qualified to develop cost effective & quick turn-around web solutions. Reduction in IT expense with PHP & My SQL database web application development, eventually increasing higher ROI for your business. Prominent visibility of your organization into business trends by developing high-performance data warehouse applications in PHP & My SQL. Cutting down operations costs by developing automated application development systems upgrading the manual processes. Expertise and professionalism to work with open sources. Skilled and competent PHP developers working solely for you. You will receive daily work status and reports. You can stay in contact with hired developers to get updates either via email, Voip phone or instant messengers. As per the requirement of project, you can choose to hire developer , whether on monthly contract basis or hourly basis period of time. It can really save your time as well as money. D’selva Infotech, Agra, India has ability to grow with your requirement. Scalable and full-bodied architecture for your application. Tested application frameworks like CakePHP and Zend Php Framework are available for rapid application development. You have access to development resources like blogs, forums and freeware scripts. Most of Open source applications works in PHP helps in considerably reducing cost. The remarkable compatibility of PHP with many web applications frameworks ensure Rapid Application Development. Our Core PHP development services render unique, dynamic and highly functional web applications. To develop competent, powerful and interactive web applications, we operate in Model View Controller (MVC) architecture that separates business logic and GUI of the development cycle and render more stable performance base and better control on it to the developers.